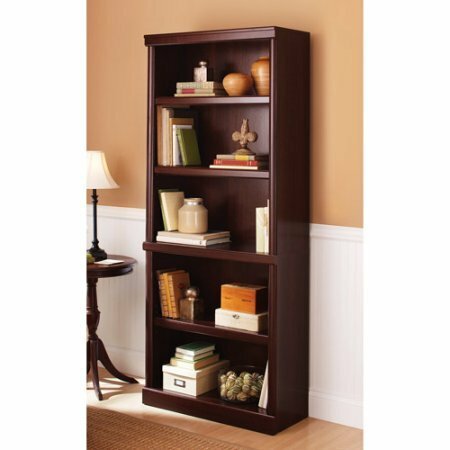 Show off your books, journals, framed photos and favorite ornaments and display items on this beautiful Better Homes and Gardens Ashwood Road 5-Shelf Bookcase. This piece features a modern style and a rich, dark finish that blends well with just about any type of interiors. The living room bookcase is made of high-quality materials that ensure durability and longevity, even while storing heavy items. It features a classic design, with patented, slide-on moldings for added style. The unit includes three adjustable shelves for added flexibility, making it easy to accommodate larger objects. The modern bookcase has patented slide-on moldings that allow for easy assembly and use. When fully assembled, the unit measures 29.29" L x 13.07" W x 71.14" H. The bookcase is ideal for living rooms, bedrooms, studies, home offices and more. The unit is available in your choice of deep finishes for added convenience.